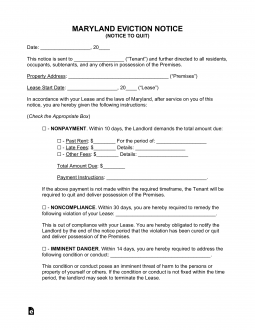 The Maryland eviction notice forms are for use in the event that a tenant fails to abide by the terms of the lease, presents imminent harm or when landlord seeks to end a month-to-month tenancy. If a tenant does not pay rent on time the landlord does not need to provide notice to tenant and may begin Summary Ejectment proceedings. If the tenant has violated the lease for any reason other than the non-payment of rent notice must be given to the tenant before making any filing with the District Court. Non-Payment of Rent – In Maryland, according to § 8-401, the landlord may begin the process of eviction immediately upon the rent being late, called a “Summary Ejectment”, without providing notice. This should be given to the tenant when the landlord has received an Ejectment Case Number and a date from the Sheriff when the eviction shall take place. 14-Day Notice to Quit (Imminent Danger) – For use when tenant poses a risk of imminent danger or harm to himself, other tenants or the property. 30-Day Notice to Quit (Month to Month) – For use when landlord seeks to terminate a month-to-month tenancy and have the tenant move out at the end of the month. 30-Day Notice to Quit (Non-Compliance) – When a tenant breaches a provision of the lease, other than non-payment of rent. Rent is late when it is not received by the landlord on the date it is due as set forth in the lease. A landlord does not need to provide notice to tenant before beginning a proceeding for summary ejectment. Non-Payment of Rent Notice to Quit – Not required to give to the tenant. If you are seeking to have the tenant removed from the property for non-payment of rent, you do not need to provide notice and may proceed directly to Step 2. Step 2 – In order to legally file an eviction in the State of Maryland the landlord will need to go to the respective District Court where the property is located and obtain the necessary court forms. The required court forms are not available online. Note: The city of Baltimore has Specific Instructions. Step 3 – When making the filing you will be required to pay the Filing Fee that is associated with the type of eviction being conducted. Step 4 – The landlord will have to have the sheriff deliver the Complaint and Summons to the tenant who will have to appear in court on the date specified. Step 5 – If the tenant does not appear in court, and/or the judge rules in favor of the landlord, tenant must be given four (4) days to vacate. Step 6 – If the tenant fails to vacate, landlord must file a Petition for Warrant of Restitution (See Sample). Again, this form must be obtained directly from the District Court and cannot be printed. Provide the signed warrant to the sheriff so that the he or she may evict the tenant. The Maryland Notice To Quit form is available as a PDF, ODT, or Word file on this page. Each one is attainable through the appropriate buttons on the right (“PDF,” “ODT,” “Word”). Before filling out this form make sure you have reviewed the Lease bearing the Tenant/Landlord Signature as some information on that Lease will need to be reported in the instructor statements. The Rented Property, at the focus of this Notice, should also be clearly defined. Do this in the first statement below the Recipient Name you just entered. Utilize the blank spaces provided to document the City, County, Zip Code, Building/Street, and Unit or Apartment Number of the Rented Property. The Signature Date on the Lease must be located and reported onto this document in the second statement. There will be three blank spaces around the term “day of” provided to report this Date. The next few statements will provide the necessary details for the Notice being served to the Addressee. You must select one of these statements as the purpose of this Notice and provide the details as required in the statement you select. The first statement, “Nonpayment,” provides Notice to the Tenant (or Subtenant) that an immediate payment of Overdue Rent must be paid or he or she must quit the Rented Property. This statement will require the Name of an individual who may accept the Overdue Payment from the Tenant, the Overdue Amount, and the Time Period the Tenant neglected to pay. The second statement, “Noncompliance,” provides Thirty Days’ Notice to the Tenant to correct a situation where he or she is considered noncompliant with or in violation of the Lease Terms or quit the Leased Property. Make sure to report the exact Violation or Breach on the blank line in this statement. The third statement, “Imminent Danger,” applies to Tenants who endanger the Leased Property or other Residents of the Leased Property. This statement will give the Recipient of this Notice Fourteen Days to quit the Rented Property. The exact nature of the Imminent Danger must be reported on the blank line in this statement. The fourth statement, “Month To Month Tenancy,” should be considered a Thirty Day Notice from the Landlord to the Tenant the Month to Month Rental Agreement these parties are currently engaged in will cease as of a specific date. This statement will require the End Date to be reported. The fifth statement, “Month To Month Tenancy,” should be considered a Thirty Day Notice from the Tenant to the Landlord that a Month to Month Rental Agreement will be ceased as of a certain Date. This statement will require the End Date to be solidified. The Owner or Landlord responsible for this Property and issuing this Notice will need to Sign his or her Name on the space provided in the Signature below the Disclosure Paragraph. The Delivery of this form must be documented in a reliable way. This may be done at the bottom of this form by the person who intends to effect delivery. There will be two items in the first statement under “Certificate of Delivery,” that must be entered (Date of Delivery, Recipient Name of Delivery). Also, this Agent must mark one of the check boxes describing the results of the Delivery Attempt. The first check box indicates a successful result, where the Notice was hand delivered to the intended Recipient first hand. The second check box will indicate that Delivery was successful in that the Notice was delivered to an of age second party that will reliably ensure the intended recipient receives this Notice in a timely fashion (i.e. household member). The third choice will indicate that a hand delivery did not occur and the Notice was mailed with First Class Mail to the intended Recipient.